The thread of the jackscrew is precision-designed in a way that enables it to withstand and lift heavy objects with convenience and for an extended span of time. It also makes the jackscrew capable of carrying enormous amount of weight and pressure for a long time. Now, the thread and the lifted material self lock themselves and make it easy for the operator to examine the bottom of the car for servicing purposes. In order to lower or raise the car, the jack has to be raised or lowered by turning the metal bar inserted into the jack. When this metal bar is turned in a clockwise direction, the screw lifts the jack and the car placed over it. Jackscrews are extensively used in a wide variety of electrical and electronic devices and are often found on numerous electronic components. Also, these screws make an important part of design for varied electrical connectors, as it forms a secured contact between the electrical device and the cable. This way, it is used for connecting televisions to DVD players, laptops etc. 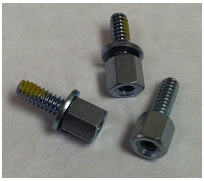 Jackscrews are considered as important components for supporting devices such as monitors, CPUs and so on. Hence, these are considered to be useful in the telecommunications industry. These are also found useful in multi-layered PCBs where the jackscrews maintain a desired distance between 2 or more objects without the fear of dislocation. Other most common areas where jackscrews are highly used is lifting or raising of heavy metallic vehicles such as cars, trucks or even airplanes for maintenance, analysis and servicing purposes. Besides being used in the aforementioned applications, jackscrews are integral part of several machineries and tools that we use in a daily basis. Dentist’s chairs, hospital beds, crockery, football stadiums, roller coasters, aircraft air bridges, theatres, trains, cars, children’s toys, generators and satellite dishes are some of the objects that used jackscrews as an important part of their design.